The most common pet hamster are dwarf species such as the Siberian, Roborovsky’s Djungarian, and Chinese, which are smaller than Syrians (also known as the golden or teddy bear hamster) at about two to three inches. Although they are cute and popular with parents, hamsters have some special requirements that must be met in order for them to be happy and healthy. Because they are nocturnal creatures, their playtime does not fit well with a young child’s schedule unless playtime with the hamster is just before the child goes to bed. Also, hamsters can nip their owners if they are awakened during the day. Because of these issues, hamsters of any breed are not appropriate pets for families with small children. 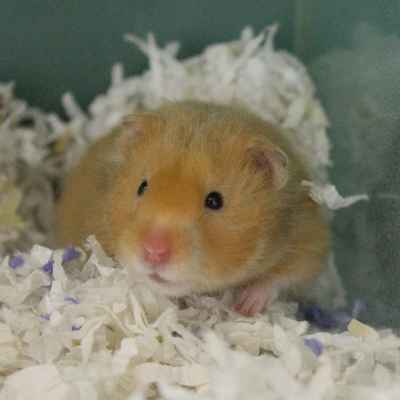 Syrian hamsters are solitary and must live alone in a cage. Do not house male and female hamsters together, since rodents breed quickly – and often – with large litters. Because they love exercise, hamsters need a running wheel. They also like to hide, crawl and sleep inside enclosed spaces, so put a small box with an entrance hole, a small never-used flower pot and tubes (cardboard tubes from paper towels and toilet paper will do fine) in the cage. Hamsters love to gnaw, so put safe chew toys in the cage. This is crucial for keeping their teeth in good condition. Keep your Syrian hamster in a wire cage with a solid floor or a habitat with tunnels. Dwarf hamsters can be kept in a cage made for mice. The enclosure should be placed away from direct sunlight and drafts. Line the bottom of the cage with bedding for added absorbency and odor control. Do not use cedar chips, as aromatic oils in cedar bedding have been shown to have adverse health effects on small pets. Hamsters also love to nest! Provide them with nesting material, such as colorful and fun shredded natural paper. Spread them around the habitat, and they will forage for the springy shreds and gather them into a comfy nest. Remove soiled bedding, droppings and stale food from the cage daily. Clean the cage completely once a week by scrubbing the bottom of the cage and soiled accessories with warm water and a gentle soap and replacing dirty litter and bedding. Make sure to rinse and dry everything completely before returning it to the cage. A hamster will stuff his cheeks with just about anything, but he needs to eat a balanced diet to thrive. Hamster food provides optimal and complete nutrition for Hamsters. Because hamsters are omnivores, the ideal diet should contain at least 16-17 percent protein. Diets with much higher amounts of protein will be rejected by most hamsters and may lead to selective feeding and imbalanced nutrition. Note that high amounts of sunflower seeds can cause obesity or nutritional deficiencies, so they should be avoided. Fresh clean water should be available through a water bottle with a drinking tube attached to the side of the cage at all times. Before you handle your hamster, he may need a little time to get used to you. Start by feeding him treats. Once you’ve earned his trust, you can gently and securely pick him up. Hold him for a short time at first, and then gradually increase your time with him. After that, you can let him out of the cage for supervised exercise every day in a small, secured area so your pet can’t get stuck behind furniture or chew on electrical wires. Also, make sure that no other pets can enter the room and that there are no house plants in reach that could be toxic to your hamster. Take your hamster to the veterinarian for a new pet exam, and again every six months for wellness exams. If you think your hamster is sick, seek medical attention immediately. Common symptoms include dull-looking eyes, matted fur, weight loss, shaking, runny nose and diarrhea. Also note that hamsters are susceptible to respiratory problems. Look carefully for signs of “wet tail,” a symptom of a serious intestinal disease. Any cases of fluid diarrhea should be immediately seen by a veterinarian.